So I flipped over that mason jar and filled it with the Cozy Christmas snowman. 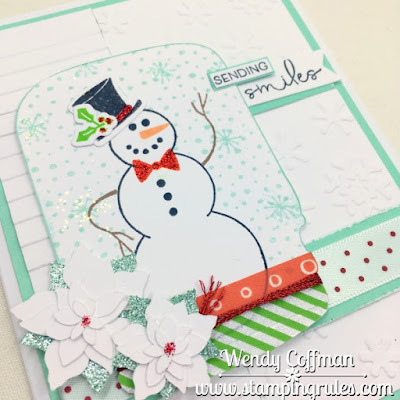 I used the matching Thin Cut dies to do his hat and the holly sprig. I loved being able to shape his arms into a friendly wave with the flexibility of a clear stamp. After I stamped his body I masked it off with a post-it and stamped on the "snow" texture using one of the stamps that came with my Flower Market Cartridge. I mounted my mason jar snow globe over two kinds of embossed white cardstock (stripes and snowflakes). White on white textured backgrounds make me so happy! I used the Mojo Monday sketch as inspiration for this card design. I cut two of these flowers from the Flower Market cartridge. I loved how the layered flower was so easy to make since the layers are automatically sized so you don't have to figure out all the measurements. I cut one at 2" plus one at 1.5" and the cartridge resized all the layers automatically - so easy! 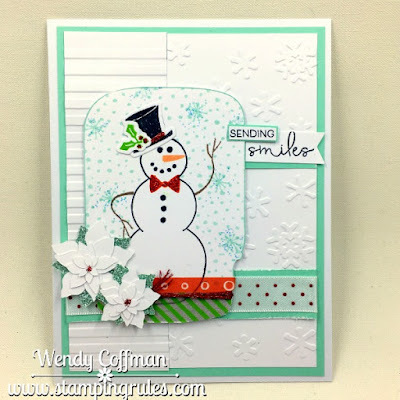 My SENDING SMILES sentiment came from another of the stamp sets that are part of the Flower Market bundle. The mixed fonts are just so pretty. I didn't mean to make more holiday cards at this point, but I'm snow glad I did!